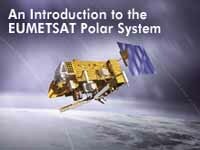 This Webcast provides an overview of the EUMETSAT Polar System (EPS), Europe's first dedicated operational polar-orbiting weather satellite program. EPS contributes to the Initial Joint Polar System (IJPS) under a cooperation agreement between EUMETSAT and NOAA to provide and improve operational meteorological and environmental forecasting and global climate monitoring services worldwide. The highly innovative features implemented with EPS include high-level sounding performance and enhanced data streams that further improve the capabilities of advanced NWP systems. The Webcast takes one hour to complete. After completing this Webcast, learners will be able to: * Identify the three major disciplines to which EPS contributes. * Describe the role of EPS within the Global Operational Satellite Observation System (GOSOS) and the Initial Joint Polar-Orbiting Operational Satellite System (IJPS). * Describe the main differences between polar and geostationary satellites. * Describe the EPS programme elements and how they contribute to the flow of data products. * Identify the instruments on the Metop satellite and their primary applications. * Describe the capabilities and anticipated benefits of the IASI hyperspectral sounder. * Describe the main services provided by EPS.